Did you ever wish you were cloned? We’ve had a crazy busy week. Harvest, of course, is in full swing in between rains, which we’ve desperately needed. There are tomatoes both to save seeds from for our seed business, and also to process into lots and lots of different tomato products. There are also dry beans to pick and shell between damp periods, some Seneca Sunrise sweet corn to harvest and bring in before the Blue Jays get it, plums to make into wild plum jam (and harvest their pits! ), apples to process, and more Dragon Tongue beans to put up. Then I got a call that our son, Javid, was in the hospital in Cook. Being in a wheelchair, he’s fought pressure sores for a lifetime. But even though the one he has now is healing, he got an infection in it. So they were going to ambulance him down to Duluth. I tossed my beans in a pail and headed off to Cook to see him before he left. He’d been running a temperature and feeling bad but with I.V. antibiotics and fluids, he was feeling better already. I did get to visit with him before he left. Yesterday, I drove down to Duluth to see what’s what. He is still getting I.V. antibiotics, but still has to see the surgeon to see if he will need surgery or not as the infection has possibly spread to the bone. That’s not good. So I’m worried and praying it won’t be as bad as that. I’m home today, doing laundry. (I ran the water over the rinse tub and Will had to rescue the laundry room, so you can see I’m frazzled.) Then I’ve got tomatoes to pick and seed, plums to make into jam, and some ripe peppers to pick for seed, as well as put up in sauce. 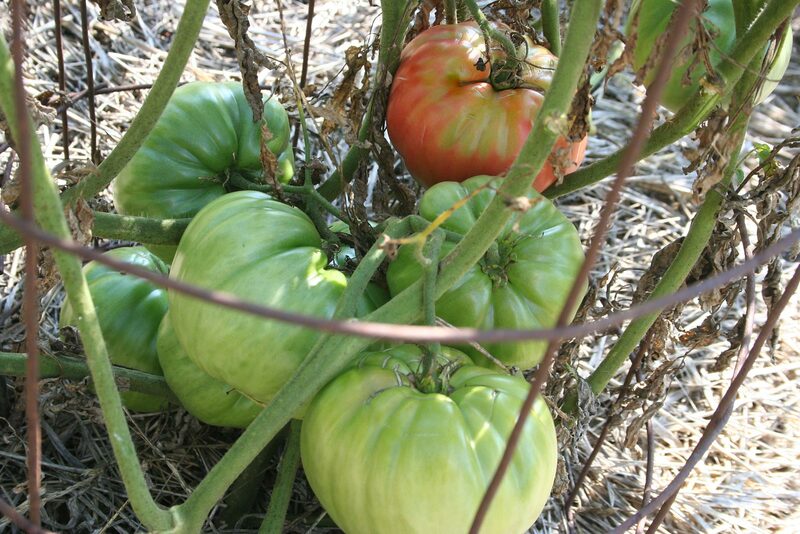 Check out the Bill Bean tomatoes. Lots of huge ones and we’ve already eaten two! We’re really happy with some of the new tomatoes and, of course, some of our favorite older ones. The Bill Beans are hugely productive this year. 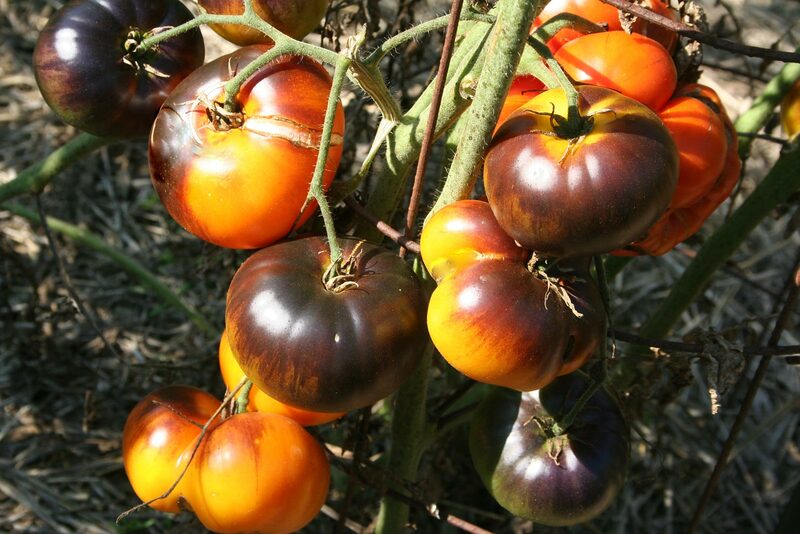 We’ve counted thirty BIG tomatoes on one plant and that’s impressive. And I love the Barry’s Crazy Cherry. 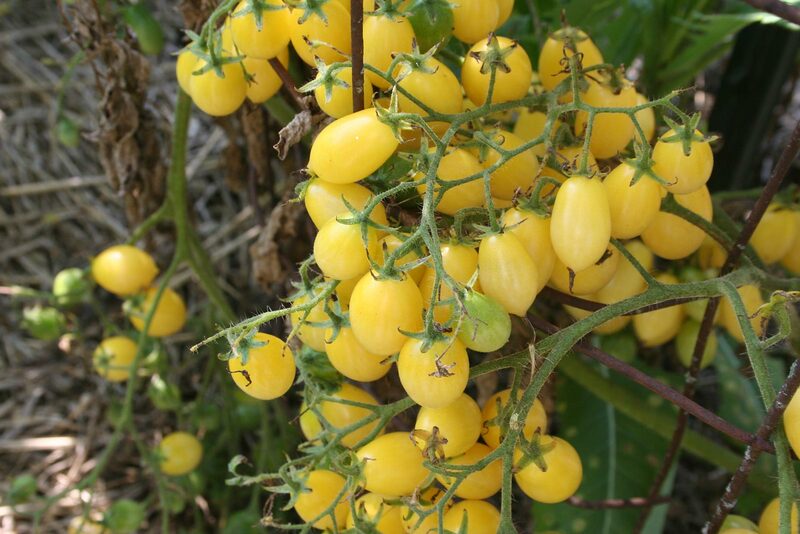 Those little pointed yellow cherries are out doing themselves! And they are so tasty, too. Can’t miss the Lucid Gem tomatoes in the lineup either. They are so gorgeous, they just glow in the garden, attracting the attention of everyone who goes there. The Barry’s Crazy Cherry tomatoes are, well, crazy productive. Sending big hugs from Florida. FINALY got to read this tonight but glad to know Javid is better and your doing better also!! After following you so many years I just want you to know that those of us out here in cyber land care so much about ya’ll! Gee, Diana, thanks you so much! Can’t really do that, this time of the year. But I will try. Javid is doing well; the infection seems to be gone and he’s feeling good. Prayers for your son and blessings for rest of you so that you can get what you need done. God Bless Jackie, I know you are frazzled so take care of yourself. Thank you for your prayers. Javid is doing great and we’re plugging along steadily. Oh I have to try some of those tomatoes next year! Lovely! I bet they taste good too! Guess what I dug up some of the dead potato plants and YOU WERE RIGHT!! There are potatoes under there after our terrible attack of potato larvae! I was so excited. We ate them already!! Thank you for the advice! So now that the Farmers Almanac has laid out their prediction for winter what are your beavers saying? They DO taste good! I’m so glad you got potatoes. Our beavers haven’t told us anything yet. I almost doubted them this spring when they built huge dams, indicating dry weather coming. Then we got rain, rain, rain! But then it went into drought. And they needed all the water they’d stored up. Pretty smart, after all. I won’t doubt them again. Hope your son is soon better. I remember wishing for a clone (or two) of me when I was farming etc. Prayers for all your family during this frantic time. Peace be with you all. You are such a blessing to everyone, prayers and thoughts for you and your family. Prayers for Javid and your family. Thanks for taking the time to share…harvest season is always amazing! Praying for Javid and his doctors. Blessings to all. We are simply amazed at our gardens this year. Thank you for your prayers. Javid is doing very well. Prayers from AZ for your son. The Barry’s Crazy Cherry tomato is a huge hit this year. So glad I got those seeds from you. I’m glad you like Barry’s Crazy Cherries. Did you ever see so many flowers and tomatoes on one plant before???? They are simply…CRAZY! May God’s healing hands hold your son. Your prayers helped! Javid is much better and feeling like himself. Prayers for your son. Wish I lived close to help you with your canning. Thank you for your prayers! Javid is feeling a lot better. I wish you were here to help can; it would be so much fun! My prayers to you and Javid as well, Jackie. May God send his healing touch to Javid’s body and His Holy Spirit send peace and calm to you and your family. Thank you for your prayers! Javid is much, much better and we are back to “normal” again. Prayers for positive healing & speedy recovery sent for Javid. ALSO, prayers being sent up for YOU, JACKIE, for PEACE WITHIN & STRENGTH TO ENDURE all that is placed upon you during your time of need. Thank you for your prayers. Javid is feeling much better. And we are feeling less stressed. See, prayers DO work! Praying for your son that antibiotics do the job!!! Prayers for Javid. Hang in there Jackie. Thanks for your prayers and thought! Javid and I are feeling much better. Prayers for God’s healing for Javid and strength for you. Thank you for your prayers. Javid is feeling much better and I’m back in the normal groove. Prayers from Maine for your son…….. Thank you for your prayers. He’s doing much, much better. God only gives you what you can handle. Been there. Prayers for your son! Hope all goes well! Thanks for your prayers. He’s doing much better and feeling like himself.